Pokemon Let's Go review: "A wonderful blend of old and new, and an exciting glimpse at the future of Pokemon"
I don't think 10-year-old me could have imagined Pokemon Yellow looking this good. There's something rather magical about seeing an Onix emerge from the rocks of Mt. Moon, so big it can't quite fit on the screen; or seeing just how tiny Pikachu looks against the hulking mass of a Venusaur in battle; or how ridiculously big my smile was when my little player hopped astride my newly captured Rapidash, flaming mane miraculously not burning my threads to cinders. For anyone who played Pokemon Yellow when it arrived way back in 1998, this is going to hit you right in the nostalgia glands. It's *almost* how you feel it used to look back in the day, but if you were wearing the strongest rose tinted glass in the entire universe. Because Pokemon Let's Go really does look that good. Whether you're playing in tabletop mode or on the big screen (or even, goodness forbid, in handheld mode without the motion-controlled catching mechanic like some kind of madman), Pokemon Let's Go looks phenomenal. Walking through each city feels like coming home for Pokemon Yellow players, but oozes with enough life and vitality to suitably impress those who are coming into the Pokemon series for the first time. The ocean's waves almost pulsate through the screen, the long grass wafts as you move through it, and the colours absolutely pop with vibrancy. Modern tweaks to the classic gameplay do help too, like making each gym feel marvellously unique, from the flower-adorned Celadon City gym, to the quiz-show themed oddities of Blaine's Cinnibar Island gym. And of course, the fact that you will see wild Pokemon emerge from the long grass and move around brings a life to Let's Go that the Pokemon series has never seen before. Rather than just moving through the long grass hoping to bump into a Pokemon you're looking for to complete your Pokedex, you'll be able to choose which critters you try to catch. Avoiding the millionth Pidgey or Rattata is now possible, with you able to manoeuvre between the wild Pokemon if you see a Farfetch'd spawn on the other side of the greenery. It's a wonderfully modern touch to the classic game that utterly works, and bridges the gap between a world that actually feels alive and the mainstay mechanics that the series has been perfecting for over 20 years. It's just one of the elements that Pokemon Let's Go has borrowed from Pokemon Go, the smash hit augmented reality Pokemon mobile game. In Pokemon Go, you choose what to catch too, with other nearby Pokemon marked on a map, and it works perfectly in Pokemon Let's Go, giving you much more control than previous games when it comes to building your Pokedex. But Let's Go also takes the idea that you simply have to catch Pokemon to add them to your collection, rather than the traditional battling. If you're playing in tabletop mode or on the big screen, you simply mime throwing a Pokeball using your Joy-Con or the ingenious Poke Ball Plus controller, following a similar process to Pokemon Go - aim for the centre of the pulsating circles, and use berries to pacify them. It might feel a bit odd to long-term fans, but actually the combination of this new catching mechanic and battling actually keeps the gameplay feeling fresh and less repetitive in the long run. This mechanic interestingly doesn't devalue the pomp and ceremony that comes with nabbing a Legendary, or particularly rare Pokemon either. Something like Snorlax, or the legendary birds, you'll have to battle first to fainting point, and then you'll have the opportunity to catch them. This wonderful blend of old and new makes Pokemon Let's Go feel more like a reboot of the series than a straightforward remastering, and that mostly comes from the way Pokemon Go and Let's Go blend. Your Pokemon Box, for example, now lives in your bag rather than on a Poké Centre computer, and the Safari Park has been replaced with the new Go Park. It's here that you'll be able to transfer Pokemon from Pokemon Go to Let's Go (although not the other way around), and then be able to try and catch them to add to your Let's Go collection. Plus, if you transfer 25 of the same species of Pokemon - such as 25 Pikachu - from Go to Let's Go, you'll unlock a special mini-game that'll earn you more candies in Let's Go. (Confused yet?). The good news is, that means completing your Pokedex is a lot easier thanks to Pokemon Go, but the bad news is that Pokemon Go compatibility isn't going live until launch, meaning I can't tell you how well it works until then. Regardless of how much I would love to. However, having now defeated the Elite Four, the most powerful trainers and your ultimate end goal as a budding Pokemon Trainer, I can tell you that the Pokemon Go implementation isn't actually as huge as I imagined. Yes, you might want to transfer some 'mon from Go to take on the various Master Trainers that you'll find around Kanto post-Elite Four, but actually in the grand scheme of things it's a actually a rather straightforward Pokemon game, albeit with some modern tweaks and rejigging. Hidden Machines or HMs, the special moves you can use outside battles to unlock new areas of the map, have been replaced by new Secret Techniques that replace traditional gameplay mechanics like Cut, Surf and Fly. For example, Fly is now Sky Dash where Pikachu takes you on a ride in his adorable balloon-powered bike to places you've already visited on the map. Thankfully, you still get them all in a similar fashion to the source material, but it does make it a lot easier to manage your Pokemon's moves without having to make space for all the HMs. Building a bond with your Pikachu or Eevee is all part of that. Not only can you deck them out in adorable outfits, they'll tell you when they're happy or sad, giving you a nudge to interact with them after beating a gym leader for example, or telling you they can feel the tension in Seafoam Islands just before you meet Articuno, while attacks and buffs are linked to your relationship with them. Plus, along with your buddy, you can have any - and I mean any - of your party follow along behind you, whether you want to ride a Charizard or watch Magikarp flop about as it follows you around. It's all utterly adorable, and makes you feel more connected to the series than ever before. You're not just playing as a Pokemon trainer, you're throwing the Pokeballs, giving Pikachu (or Eevee) belly rubs and interacting with the game more physically than ever before thanks to the Joy-Con controllers paired with the Switch's touchscreen. Of course, all of that doesn't detract from the fact that the game is drizzled with a generous helping of nostalgia, from the fact the Pokeball Plus emits the original 8-bit Pokemon cries when you catch a critter, to the fact that even though some of the mechanics have changed, there are nods everywhere to the characters you would have met in the original game, from Bill to the Safari Park guy who's lost his teeth. All of that heightens the fact that this is Pokemon Yellow all over again, complete with your very own Pokemon buddy, but with a new level of finish and polish that hasn't been seen before in the Pokemon series. As this is the first ever console Pokemon game (bar classic spin-offs like Pokemon Snap and Pokemon Colosseum of course) there's obviously quite a high bar in the Pokemon community as to what we're expected. But, from everything I've seen Pokemon Let's Go do, even within the constraints of a Pokemon Yellow reimagining, it feels like an exciting glimpse at the future of Pokemon. From the slick cutscenes and the Pokemon animations, to certain gameplay tweaks that made me literally giggle with glee (and I won't ruin for you here), Pokemon Let's Go is definitely a shift towards a Pokemon future I can't wait to see. I'm not entirely sure that Nintendo's pitch of Pokemon Let's Go as a beginner's foray into the series is appropriate though. 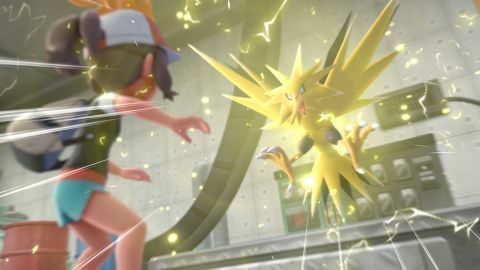 Although there are definitely elements that have been simplified - like the removal of HMs, and the adoption of Pokemon Go's catch mechanic - there's still the same level of complexity in battling, levelling, items and status changes that have been the core of the Pokemon series from the get go. Let's Go doesn't offer the simplicity of Pokemon Go, but that's a really good thing for the core series, as at no point does the game feel dumbed down or bereft of features. Even if you see Pokemon Let's Go as a stopgap before the major Pokemon Switch game launch next year, you're going to find plenty to praise here. Never before has a Pokemon world felt so alive, and if this is a sign of things to come, you're about to be very excited indeed.